Some foods are better left to the pros. Steak, for example. I can never get the doneness just right or a sear that’s consistent from time to time. Beer is another. After getting all the equipment and going through the multi-week process, our best home-brew was almost as good as a decent beer from a brewery. And that’s before you have to brush all the beer gunk out of the bottom of the bottles before the next go round. The cost-benefit was never quite there for me, and I imagine it wouldn’t be without buying all the gear needed to make pro level stuff. At the other side of the spectrum, there are foods that, once you make them yourself, the store bought brands will be forever ruined and you will find yourself shelling out for specialized kitchen accessories that are completely useless for other things. This stuff blows away anything you can buy at stores and bakeries. 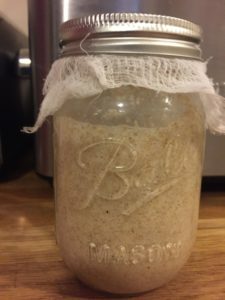 When you use a homemade sourdough starter, you are making a culture of the natural yeast and bacteria that are present in your flour and local area. This is what gives the bread its complex flavors and slightly tangy zip. Drawback 1: Taking care of a sourdough starter is a big commitment — along the lines of a fussy houseplant. Sourdough baking requires a certain domesticity of lifestyle because the starter will start to go bad if you don’t feed it every week or so. Drawback 2: Actually making the bread is a day-long commitment. 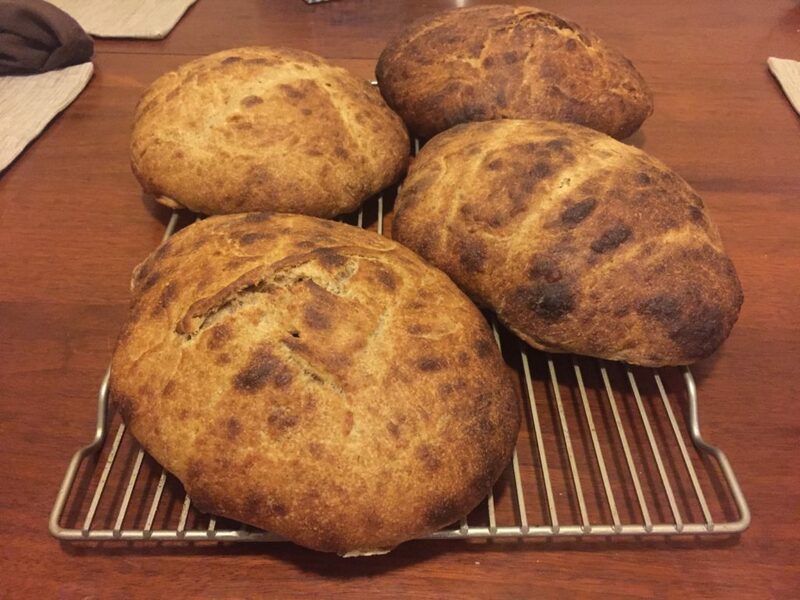 You’re going to make your dough right when you get up in the morning and it won’t be ready to eat until dinner time, if you wait the recommended resting period before eating the bread (at our house this is sometimes ignored). Drawback 3: There is potential for domestic conflict over whether the loaves should be gifted or eaten at home. This can get ugly. I recommend scaling up the recipe if you have a bigger bowl because making extra loaves in what is already a daylong process doesn’t require that much marginal effort. Now that we’re fully disclaimed, let’s dive in. I think this is my first ever blog post with chapters. Searching the internet for sourdough starter tips will make your head spin. Much of the literature starts with gestures at the old-school Klondike badasses. They would just toss whatever carbohydrates they had lying around into a jar and roll it up in their sleeping bags at night, like, totally unconcerned about getting the right size air bubbles. “Don’t stress,” they say, knowing full well you, at that exact moment, have 15 browser tabs open agonizing over slight variations to recipes. There are discourses on which flour to use, why you should filter your water, how often to feed it, and of course this epic two-part series, legendary in internet sourdough bread-making circles, on why you should be using pineapple juice in your starter (“The Pineapple Juice Solution.” [part 1] [part 2]). Starter is flour and water, mixed to a pancake batter-like consistency that has been left out to ferment. As it ferments, the yeast and other bacteria that occur naturally in the flour and in the air will eat the carbohydrates in the flour, producing carbon dioxide. This creates the air bubbles which leaven the bread. Lactobacilli bacteria are the other byproduct. This is what gives you the complex, slightly sour taste. Online, you will hear tales of hundred year old starters, or ones spawned off some famous, historical starter. But in the long run, the flavor of your breads is going to be determined by your starter (particularly how recently you’ve fed it) and the flour you are using which contain differing types and amounts of naturally occurring yeasts. And because the yeast and bacteria are highly variable from place-to-place, taking a genuine San Francisco sourdough starter and transplanting it to a different climate is just going to kill off the San Fran yeasties, replacing them with local strains. So it’s fine to spawn your starter from an existing one (this will shortcut the process), but totally not necessary. 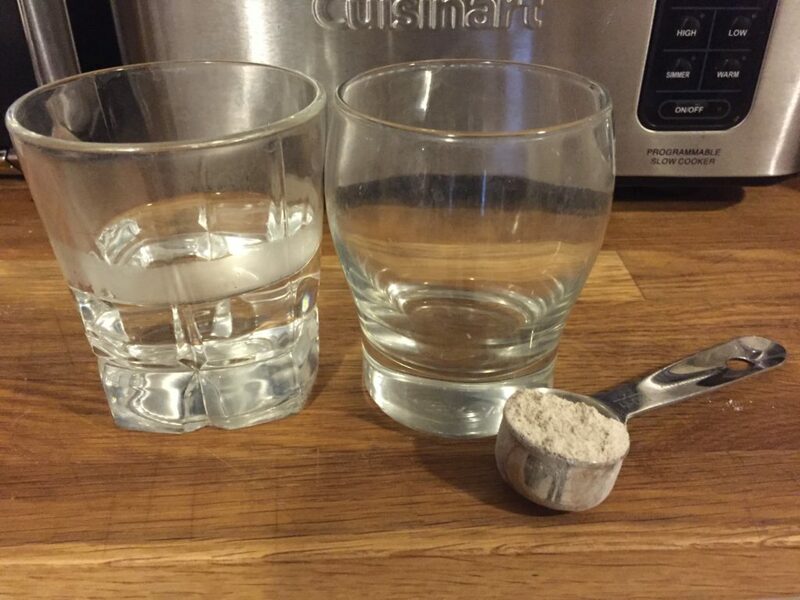 Day 1: In your mason jar, mix one tablespoon of rye flour with one tablespoon filtered water at room temperature (if coming from the fridge, I’ll microwave my water for 30 seconds to get it slightly warm). Cover the top with cheesecloth and let it stand at room temperature overnight. Why rye flour? You can use pretty much any flour you want. It took me longer to get good bubbles going with all purpose flour. Something like a whole wheat or rye flour is going to have more natural yeast and minerals in it, which are good for the bacteria. Day 2: Obsessively check your proto-starter for tiny bubbles and other signs of fermentation. You shouldn’t see any yet but never hurts to check. Add another tbsp of rye flour and filtered water. You should be stirring these thoroughly to get lots of oxygen into the mixture. Day 3-5: Continue feeding the starter daily. You can now add 2 tbsp of flour and water each time. At this point you should start seeing tiny bubbles form in the mixture several hours after it has been fed. Fermentation is happening! It should also start smelling bready, slightly sour and delicious. Day 6-12: As your starter grows and the yeast population with it, things get Malthusian. There are exponentially more yeast mouths to feed but only so much room in the jar for more flour and water. So we need to thin the herd. Before each feeding, start pouring out about half the existing starter. This will improve the yeast-to-flour ratio and provide a better environment for your yeast to multiply and produce a rich flavor. At this point you don’t need to measure out your flour and water exactly – just add enough to keep it the consistency of pancake batter. Ongoing: You now have a ready-to-use sourdough starter. It should be bubbling nicely starting a few hours after feedings and have a bready odor. You can now transfer it to the fridge where it can go 7-10 between feedings. When I feed my starter that’s been kept in the fridge, I usually take it out and give it a few hours to come to room temperature, do the pour and feed, give it a good stir, wait an hour or two, and then back into the fridge. One or two days before you bake, it’s a good idea to take the starter out of the fridge and give it a few feedings (spaced 8-10 hours apart) so it can “wake up.” This is also an opportunity to build up the starter volume so you’ll have enough to bake with, with some left over to keep the starter going. No Bubbles / Activity: Make sure you are using filtered water, and keeping your starter in a warm but not hot place. Try switching to rye, or a heartier organic type flour. These tend to have more yeast in them. Keep trying with smallish feedings and make sure you are stirring vigorously to aerate the mixture. Go a little heavier on the flour (sometimes bubbles can escape rather than stick in the starter if your starter is too liquidy). If you don’t see any bubbles after 10 days or so I’d start over using the pineapple juice method linked above. Something growing on it: Some people will tell you to scrape the mold off and feed again. That’s gross. Just dump it out and try again. Very sour, acrid smelling and/or dark liquid on surface: Your starter is not being fed enough. 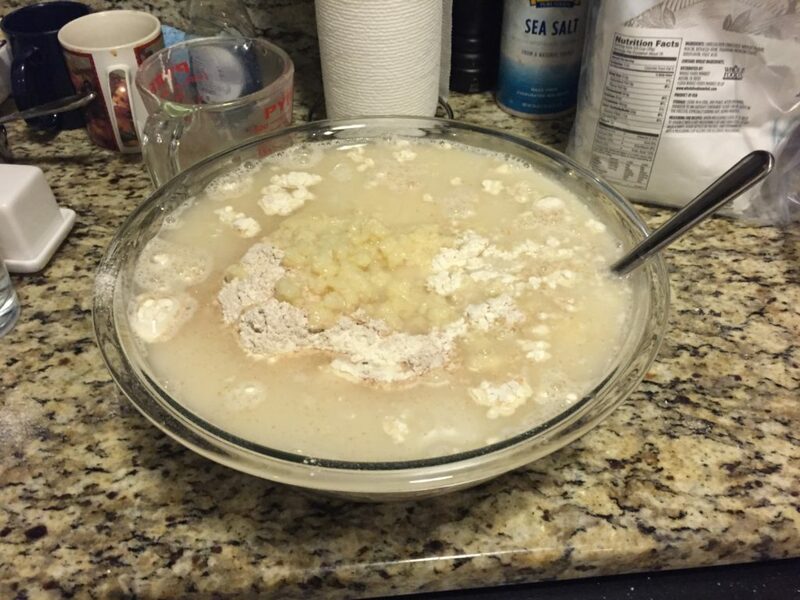 Dump out a good amount of the starter and give it a healthy feeding. It should return to normal smell in 1-2 feedings. When you bake, you want your starter to be nice and active. So if you’re keeping your starter in the fridge, take it out the morning before and give it two healthy feedings. Make sure the feedings get your starter up to at least a cup and a half, so you’ll have enough left over to keep it going after you take some out to bake with. Leave it out at room temp overnight. “Scalding” a portion of your baking flour with boiling water is an interesting technique that shows up in various bread making traditions around the world, including Scandinavia and parts of Asia. Scalding flour creates a gelatin out of the starch, leading to a moister, fluffier texture. Put a few cups of filtered water on to boil. In a large mixing bowl, mix one cup all purpose flour with 1.5 cups of boiling water. Stir carefully with a fork until it is mixed and let it stand for 5-10 minutes. Add 1.5 cups of cold filtered water and mix. The dough will look lumpy and runny. Once your scalded flour is cool down, it’s time to add the other flour and water. To your big bowl, add in the remaining 5 cups of all purpose flour, 3 cups whole wheat, 2 cups rye, and 1.5 cups oats. Add in the remaining 2.5 cups water. Use a fork to stir up your starter and fully aerate it. This may reduce the volume a bit by getting the air bubbles out. Add 1 scant cup of the starter and knead the dough until all the flours and water are incorporated. This stage also has a ‘feel’ element that may take a couple bakings to get right. You want the dough in a sweet spot where it’s fairly moist – more moist than most doughs I’ve worked with. This gives the bread a springy texture. But you don’t want the dough to be so sticky it sticks to the pizza peel when you’re sliding it into the super hot oven. A rule of thumb: if you can put the dough down and it doesn’t stick to your fingers it’s too dry, add more water. 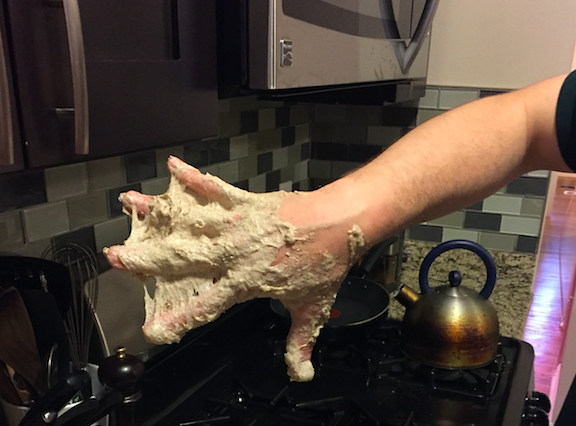 If you need to wash your hands a bit to get the dough off it’s just right. If you need to scrub each finger, fingernail, etc to get the dough out of every nook and cranny then it’s too wet and you should add more flour. You can add up to 1/2 cup of flour or water to get the consistency right. This won’t screw up the bread. Stop mixing once you’re happy with the texture and everything is combined. Cover your dough with a damp cloth and let sit for about an hour. Notice we have not yet added the salt. This pre-salt period is called the autolyse. It is giving the yeast in the starter a chance to chow down on the flour without any salt to slow down fermentation. The flour also has a chance to soak up more water and start forming delicious, delicious gluten. Uncover your bread and sprinkle in 4.25 tsp of sea salt. Set a timer for 15 minutes and start kneading the dough. This should be tiring but not forearms-on-fire tiring. If it feels like you’re about to pop a tendon in your arm, you may add a bit more water. As you knead, the dough should start out shaggy, with little peaks all over. As you knead, it will get smooth and more uniform throughout. The bread is fully kneaded when you can stretch a lump of dough out and just begin to see light through it. A Note On Rising Times: All the times in this stage of the recipe are approximations based on previous bakes. You are not going to ruin your bread by going faster or slower at a given stage as long as your bread has enough time overall to rise. If your house is cooler the process could go a little slower and vice versa. 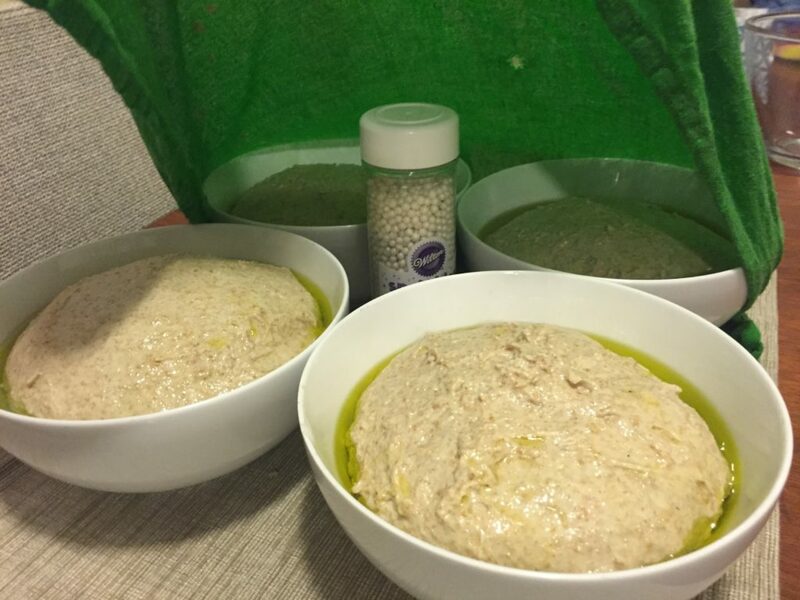 Once kneaded, return the dough to your main bowl, cover with a damp cloth, and allow it to ferment for 2-4 hours. About halfway through this period you want to “knock back” your dough. When the dough has increased significantly in size, pick it up and gently fold it over itself a few times, pressing down a bit as you go around. This will release the CO2 bubbles that have built up during initial fermentation and allow the process to continue. About another hour after your knock back, the bread will have risen again and it’s time to separate it into loaves. We will use cereal bowls (other recipes call for cute, individual baskets. These will amp up the Martha Stewart factor but are not necessary). Get your 5 cereal bowls ready, along with some paper towels and your bottle of olive oil. We’ll use the oil to lubricate the bowls so that the dough doesn’t stick to them. Pour some olive oil in a circle around the bowl and rub it around the inside with a paper towel. Take about a fifth of the dough (doesn’t have to be exact, you can always top up the runts later) and start folding it. Stretch one side of the dough out a bit and then fold that back over the center, then rotate it a bit and repeat. As you do this a few times, your dough will get a tight dome-shaped top. There will come a moment — and you will develop a sixth sense for this after a couple loaves – when the dough is perfectly formed into a tight little package. When this moment comes, plop the dough, dome side down, into your cereal bowl. Drizzle a bit more oil around the perimeter and set aside. Repeat this process to make five loaves total. Now, we need a way to keep our loaves moist while they proof. I have developed this patent-pending rising tent design, consisting of a bottle of sprinkles to keep the moist cloth off the dough as it rises. You are now t-minus an hour or two till bake time. Your sourdough bread is now “proofing,” or doing its final pre-bake rise. This could take anywhere from 1-3 hours. 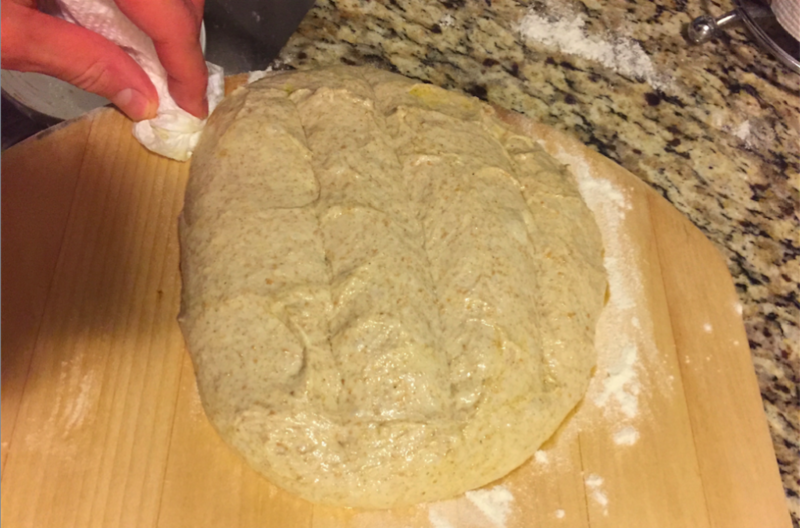 The dough should rise noticeably in the bowls during this time. The dough is ready for baking when you can poke a wet finger into the dough and the indentation remains at first, but then slowly rises out. Time to get the oven ready. Make sure your pizza stone is clean and position it in a middle rack of the oven. Put your cake pan at the bottom of the oven and fill it with water; you will probably need to re-fill this once during your bake. About an hour before bake time, turn on your oven to 515 F. Before baking, you want to go about 20-30 minutes beyond your oven’s standard preheat time because the pizza stone needs more time to heat up. Assemble your baking station. You’ll need your pizza peel, thermometer, x-acto knife, some white flour, a paper towel, spatula, and of course your doughs all within easy reach. Sprinkle a pinch or two of flour into your pizza peel, and spread it evenly over the front. Take one of your doughs and carefully pour off excess olive oil around the edges. Gently plop the dough onto your pizza peel, using your fingers to release the dough from the bowl if necessary. Using the paper towel, scrape off the excess flour from around the dough’s edges. This will prevent it from getting transferred onto the pizza stone where it will get instantly scorched, setting off all the smoke alarms in your place. Using the X-acto knife, cut 2-3 quick slashes down the length of the bread loaf and then transfer the dough onto the pizza peel, using a spatula to dislodge any sticky areas and re-form loaf if needed. Set a 15 minute timer. When it dings, use the thermometer to check the temp in the center of the loaf. The loaf is done when it reads 180-190F. The first couple loaves will take a few extra minutes. Later loaves may take a bit less time as the oven and pizza stone continue to heat up. Using the pizza peel, take the bread out (you may need to chip away some at the bottom to get it unstuck) and transfer it to a cooling rack. 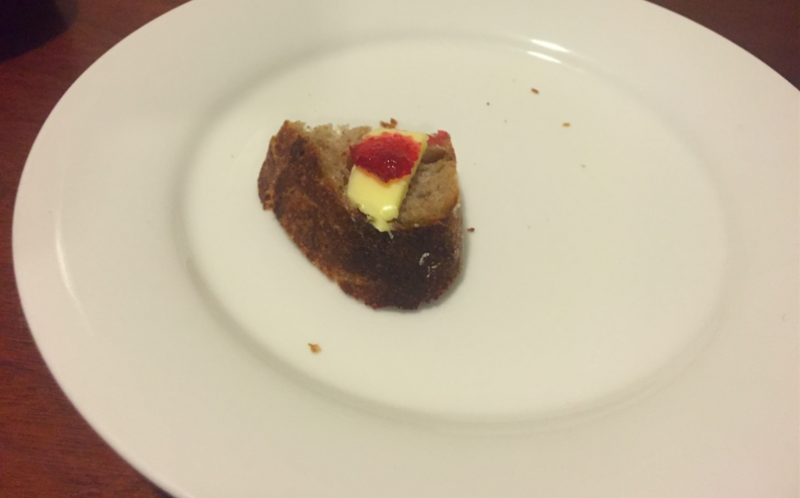 Using any scraps of willpower remaining, try to resist the urge the cut into the bread right away. It is still cooking for about 45 minutes after coming out of the oven. If you cut in too early the center will be gummy and mess up the texture of the entire loaf. Repeat this stage to bake the next four loaves. I’ve found that it’s best to do the loaves one at a time. If my oven and pizza stone were slightly wider, I’d do two at a time. Make sure you’ve got some high quality butter and jam on hand. After the breads cool, I keep the ones I’m going to eat in the next few days wrapped in a kitchen towel on the counter. The others I freeze in large ziplock bags. These loaves freeze really well and defrost quickly when you’re ready to eat. Note: This recipe is an amalgamation of many recipes and my own experimentation. But special credit is due to the excellent sourdough bread tutorial at Splendid Table by Kiko Denzer and Hannah Field. It’s hard to navigate a wall-of-text recipe with your hands full of sticky sticky dough. So here’s a handy one-pager you can print out to keep with you in the kitchen as you bake. Bread is done when an inserted thermometer reads 180-190F (about 15 min). Do not let go over 190. If you want to make rising go faster: Heat dough slightly while rising (eg turn up thermostat, place dough in oven with boiling water poured into a pan at bottom).